Ballet BC’s studio at Scotiabank Dance Centre is large and bright, with a sprung floor and big windows. That’s where artistic director Emily Molnar is rehearsing her dancers in Twenty Eight Thousand Waves by Cayetano Soto. Despite the demands the choreography makes for power, precision and speed, Molnar’s approach is not to whip up easy enthusiasm, but rather to quietly examine even the biggest, most forceful movements. Her curiosity creates a thoughtful atmosphere that encourages the dancers to explore their ideas and intentions as they work to perfect the physical moves. On more than one occasion, Molnar has said she wants her dancers to be thinking individuals who bring curiosity to the shared enterprise of putting ballet onto the stage, and the present incarnation of the group (14 company members and three apprentices) seems to be doing exactly that. Of course, she also wants virtuosic technique and that too is something Ballet BC have fine tuned since she came on board as director in 2009. She works first with a trio of men, coaxing nuances out of powerful movement she suggests should be “more about an inflation of energy than aggression,” and then on an intimate male-female duet studded with fine, ferocious lines. There is a hum of activity around the room as the others tackle whatever is necessary for them to achieve the soul as well as the mechanics of the piece. It’s such a pleasure to be there watching this talented group of individuals up close. There isn’t one who wouldn’t reward close study, and last November’s show on the large stage at the Queen Elizabeth Theatre, where they have their home season, was danced with conviction. As far as contemporary ballet bills go, it was a tribute to Molnar’s programming and also a testament to the company’s ability to attract high-profile choreographers. 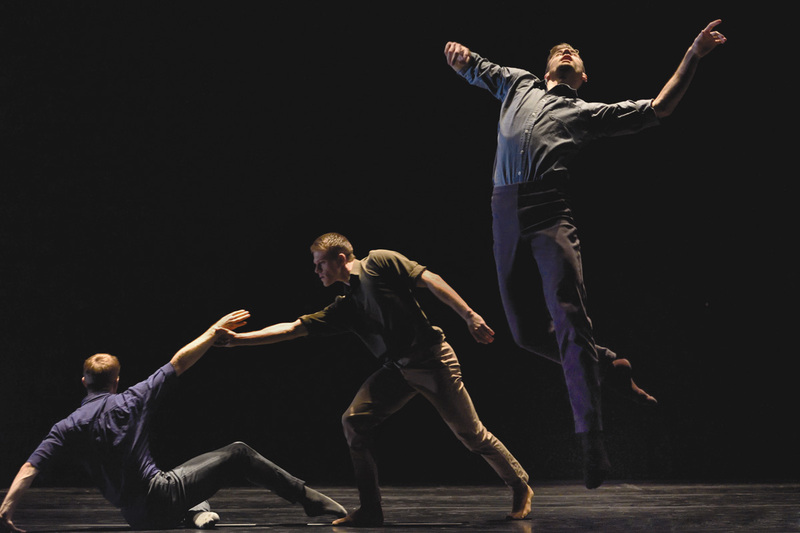 The evening offered the first sighting in Vancouver of work by Belgian Stijn Celis, one of more than 30 premieres Molnar has commissioned for the company from Canadian and international choreographers. 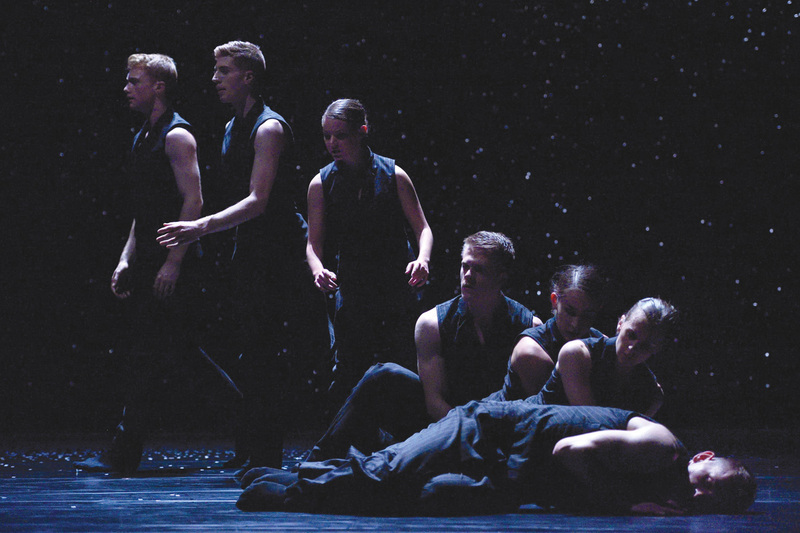 Celis’ Awe, for 12 dancers, begins with the high spiritual drama of the onstage choir’s De Profundis, which almost overwhelms the small round bodies moving quietly in the dark. Awe slowly builds power until the end, when the dancers flicker upward in the gloom like stars twinkling in a night sky. Crystal Pite was on board, too, remounting her masterful Solo Echo, created in 2012 for Nederlands Dans Theater. Here, in an atmosphere of epic loneliness, seven dancers constantly come together and break apart, while the warm romance of the Brahms’ music sounds like it’s coming from another world or time. Finally, in the remount of Soto’s Twenty Eight Thousand Waves, the company seems to have an ideal high-energy calling card. The work features exaggerated, hard-etched poses — spiky fingers, hips pushing way out — with bare-chested men in flippy skirts and a sense of suspension throughout, as if something big is about to happen and the men and women onstage are poised on the edge waiting for it. It will be interesting to see how Soto follows this popular work in his role as resident choreographer. The program was a thrilling ushering in of Ballet BC’s 30th anniversary season. This longevity is a real achievement in Vancouver, where ballet has become such a hard sell in recent decades that few companies dare tour here, which makes Ballet BC all the more important to west coast dancegoers: the company’s home season, with its range of international choreographers, and their occasional presenting (the annual Alberta Ballet Nutcracker, Miami City Ballet last year) is a lifeline connecting us to the world. In half a dozen years, Molnar has made Ballet BC more than just a player in the local scene; it’s now a popular force across Canada and increasingly in the United States. They received warm press after their return to Jacob’s Pillow in Massachusetts last summer, and in November they returned to Portland, Oregon’s White Bird festival. Ballet BC is now set to make inroads into Europe with a tour to the Birmingham Hippodrome in May, presenting a mixed bill that will include Molnar’s, 16 + a room, a 2013 piece for 16 dancers that features impressive vigour and sweep. After her appointment to Ballet BC, her choreographic ambitions went on the back burner; she now choreographs about one new piece a year for the company, most recently the Stravinsky-less RITE for 18 dancers. In that dream-like ballet, Molnar integrated evocative historical references to Nijinsky’s choreography within a fluid, dramatic vocabulary. Like most artistic directors and choreographers, Molnar started out as a dancer. 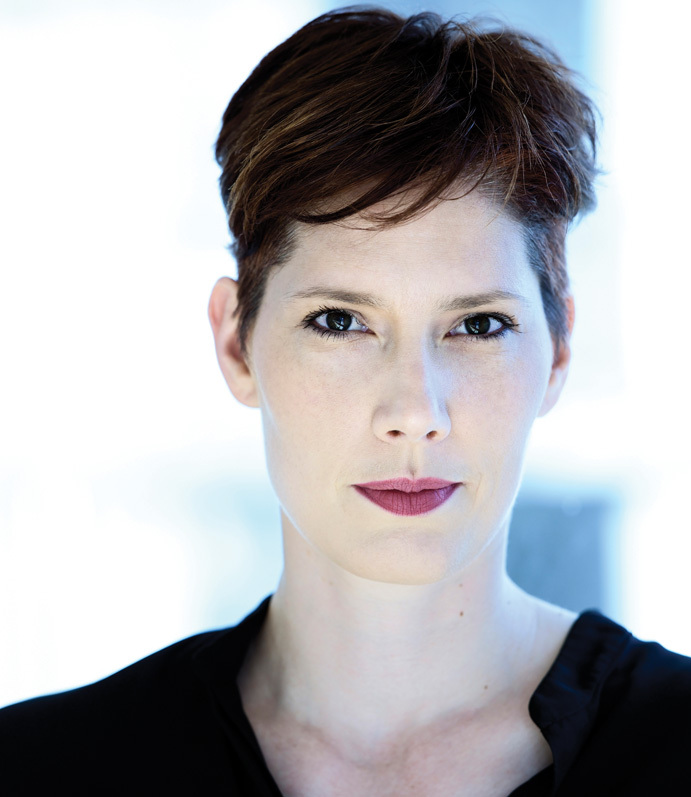 The Regina, Saskatchewan-born artist began her professional career performing with the National Ballet of Canada, then joined William Forsythe’s innovative Ballett Frankfurt. As a member of Ballet BC from 1998 to 2003, she often took on lead roles in then artistic director John Alleyne’s work. A highlight was the surprise casting of Molnar — a tall, naturally regal woman — as Puck in his Faerie Queen (based on Shakespeare’s Midsummer Night’s Dream), which featured a solemn, twisting solo that provided the poignant conclusion. There is another significant facet to Molnar’s professional profile: in 2014, she was appointed as the first artistic director of dance at Alberta’s prestigious Banff Centre, where she is involved in revisioning the dance program. Molnar talks enthusiastically about thematic residencies and interdisciplinary platforms for creation, and how the new model is less about fitting participants into the usual ballet or contemporary boxes, and more about following their unique needs and interests. “It’s about the artists who are doing the work now and their points of view,” she says, referring to the broad-based, multi-faceted influences and styles of today’s professional dance scene. She’s proud of the advisory group she assembled, which is made up of professionals who understand dance from a range of perspectives, from presenting to choreographing to running companies to training. The post involves regular visits up to Alberta’s Rocky Mountains where the Banff Centre is situated, and it’s hard to imagine how Molnar has the time to fit this additional responsibility in. Yet it’s also clear she is the right person to find new models of creation and collaboration to refresh the longstanding dance program. The position provides an opportunity to connect with other committed professional artists over issues of training and creation, and can only enrich Molnar’s own creative capital, helping her answer the questions she is driven to ask about the inner workings of dance. Emily Molnar is now a key figure at the Banff Centre as well as the popular leader of Ballet BC. And still, it seems, driven to dance herself, to explore the art form from the intimate perspective of her own body, alongside her dancers in class or when leading rehearsals, and maybe once more onstage. Chessa grew up in Richmond, British Columbia, just outside Vancouver, and began her professional training at 15 at the Royal Winnipeg Ballet School. She then danced in the graduate program at Arts Umbrella in Vancouver under the guidance of Artemis Gordon, where she had the opportunity to work with major choreographers like James Kudelka and Aszure Barton, and local innovator Wen Wei Wang. dancers manoeuvre and climb. “To see it, get inspired and then be able to perform it — that’s pretty special,” Chessa says. Chessa, who has a reputation as the resident music lover, was the first to be featured on the company’s blog for their Dancer’s Playlist series; her top picks included songs by Youth Lagoon, the National and Jesse Woods. It’s lunch break at Ballet BC, and Gilbert Small is eating homemade curry and a piece of company dancer Tara Williamson’s birthday cake. The cake was left over from a recent Ballet BC weekend retreat, where the dancers were encouraged to think big about the art form, both as individuals and as members of Ballet BC. Twenty-eight-year-old Small, inspired by the retreat, says he believes a good performance requires both humility and passion, and he hopes his performances make audience members question what they want from life. Born in Baltimore, Maryland, Small always knew he wanted to be a dancer. He began serious ballet training at the Baltimore School for the Arts at age 10, and went on to study at the Dance Theatre of Harlem School, the Springboard Danse Montréal project and the Hoge school voor Muziek en Dans in Rotterdam, Netherlands, among other places. He is also the proud holder of a bachelor of fine arts degree from the Conservatory of Dance at Purchase College in the United States. Joining Ballet BC from Sidra Bell Dance in New York City, Small was the first hire after Emily Molnar became artistic director in 2009. Now in his seventh season, he reflected on how things have changed for him since moving to Vancouver. “I felt quite alone for a long time here, and I’m just starting to find my way,” he says. Growing up, Small loved Don Quixote and Sleeping Beauty, but he is happy to be with a contemporary company and does not miss classical ballet. “What I’m doing here is exactly what I want to be doing,” he says.